This project aims to develop high-biomass sorghum with superior drought/salinity tolerance. The CASP team has developed phenotyping test sites in California and Texas to provide ideal conditions and real environments. The lack of rain during the field trial period allowed irrigation to be precisely controlled in California, and Texas is one of the top sorghum producing states in the United States. The CASP team uses a sensor suite of LiDAR, multispectral cameras, and thermal cameras on an unmanned aerial vehicle (UAV) that detects traits indicative of improved yield and tolerance of drought and salinity. Data-processing software translates UAV-based imagery into measurements within the same day as UAV flights. To link the phenotypes observed by the UAV to specific DNA sequences (markers or candidate genes), the team has applied large collections of diverse sorghum germplasm for genome-wide association studies to field phenotypic data. Over 200 genetic markers associated with drought tolerance and/or biomass accumulation were identified over an entire growing season to ensure accurate phenotyping. The temporal information obtained by phenotyping throughout the season allows researchers to confidently identify genetic markers associated with the traits measured and identify genes that are important at specific life stages. In parallel, combining field phenotyping of morphological and behavioral traits with molecular phenotyping of transcript, protein, and metabolite profiles provides a mechanistic understanding of observed traits, such as biomass and leaf size. Generated metabolite and protein profiles correlated to plant functional traits can be used with low cost, rapid detection to identify superior sorghum genotypes in marker-assisted selections. The development and commercialization of high value, generalized genome-to-phenome tools will enable advances in energy crop yields like biomass sorghum. Currently, advanced tools for genetic improvement in bioenergy feedstocks are not available as they are for row crops. In 2017, the team completed a proof-of-concept project on field corn with a major U.S. seed company, collecting data in the Midwest and demonstrating the successful collection of plot-level plant traits. Over the next few years, the CASP team expects to expand into the plant breeding industry. 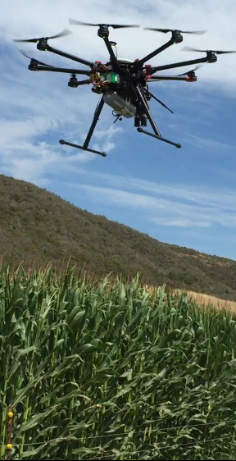 Other applications of UAV-based phenotyping include research in precision agriculture contexts, such as characterizing performance of various precision machinery. The UAVs developed by Blue River Technology (BRT), a member of the CASP team, produce plant field maps that provide breeders and growers with unprecedented insight into crop health and yield, with the fastest turnaround time in the market. In September 2017, John Deere acquired BRT for its expertise in applying computer vision, machine learning, and robotics to agriculture. This acquisition opens up the possibility of UAVs phenotyping for other applications. Breakthroughs in field-based phenotyping technology coupled with molecular profiling for plant traits could decrease costs for developing sorghum cultivars and screening methods for other crops. Application of the new phenotyping methods could accelerate the sorghum breeding process by as much as three years (on a typical 10-year development cycle) and save millions of dollars in bringing a sorghum cultivar to market. CASP’s findings will contribute toward the development of high-biomass sorghum with superior drought/salinity tolerance. The expanded use of resource-efficient energy crops could minimize competition with food crops. If successful, these technologies will enable greater U.S. production of renewable bioenergy and bioproducts, which will enhance U.S. economic and sustainable energy security. As of December 2017, the CASP team has published the scientific underpinnings of this technology once in open literature.